The legal battle between Apple and Samsung is heating up, and after Apple accused the Koreans of “slavishly” copying iDevices, Samsung has replied vigorously by first asking to see the next-gen iPhone and iPad, while now it's asking the US International Trade Commission to ban imports of Apple-made products into the United States. The claim is made over patents and extends over iPods, iPhones and iPads, which are only designed in the States, but have to be imported from other countries where they are manufactured. "The complaint requests relief in the form of a permanent exclusion order prohibiting entry to the United States of all Apple products in violation of these patents," Samsung mentioned in a statement. Samsung is a big patent holder, but in this case it alleged Apple of infringing five patents in a lawsuit filed in Seoul, two patents in a lawsuit filed in Tokyo and three patents are mentioned in its legal claim filed in Mannheim, Germany. The lawsuit has escalated despite the fact that Apple and Samsung have a close relationship as the Koreans are a major producer for iDevice parts. Only this year, Cupertino is estimated to buy $7.8 billion worth of silicon from Samsung. At the same time, though, reports have surfaced mentioning Apple's attempts to lessen that dependency and partner with Chinese TSMC for the A6 chip, expected to power Cupertino's products in 2012. Could the ITC really ban Apple products? As drastic as the allegations sound, the ITC will need to closely examine them, which alone could take quite a while, and that seems like plenty of time for Apple to react with yet another lawsuit. Lol. It's like a wrestling match at this point. Seriously. .... and can you blame them??. Apple are really taking the piss now. I mean seriously, do they really think they can beat down "Korea"? Why is this not a featured strory? It siunds pretty serious. Hey Apple opened this can of worms. Apple is not the only one who can play this game. Samsung is not going to be bullied by Apple. Without Samsung, Apple would not be where they are today. Apple needs a shot of humility. Something to knock them out of their high horse. Well Apple if you didn't see this coming then you really had no foresight! It is what it is! Straight & simple. Samsung HAS a right to retaliate. If this goes down then Apple will be dealt a blow on monumental proportions! Let’s see how this plays out. I think they should just meet at the squared circle! Lol ROUND ONE….. FIGHT! Probrably more around round 4 lol, theyv'e been back and forth for a while now. i think he means like an actual fight. he did say the squared circle. Yeah, Apple is Hulk Hogan and Samsung is Pewee Herman. since u didnt put a time period on how old each of these 2 are when fighting, id say "current condition" in which you just pitted a 60 something year old fake wrestler with arthritis and a really bad hip against an ugly skinny dude. Hulk is a nice guy, but he is well past his glory days. Id take peewee herman over hulk in this match.. mikalika high, likahineee hoooo mofugga!! lol. Lets go Samsung :D ! Apple you picked the wrong person to mess with.! Apple could get around the ban by paying for the infringements outright, leasing the right to use the patents, or simply apologize to Samsung for being such arses. apple did try to stop the sales of the galaxy products but they failed as will samsung..i completely agree with you, the more choices the better..this lawsuit is just becoming ridiculous..if apple believe they so superior then they should not have anything to worry about..let the consumers buy what they want. So you wish a foriegn company that pays little in US taxes to beat out a US company that pays US taxes? Literally rooting for a foriegn company to take out a company from your country is like rooting for someone to kill your brother. rooting for a foreign company and paying taxes? think about apple importing most of their parts from other countries to avoid paying more tax and giving jobs to other countries instead of making it in the US. and thats why i could never buy anything from APPLE. They dont MAKE anything. They source it out to Foxconn in china who pays their people so LITTLE that they had to install SAFTEY NETS around each building because people COMMITING SUICIDE was too COMMON. You think any of those slave labor goods get american taxes on them? lol. besides, all companys that sell goods in america pay taxes if they were made in america or not. There are import taxes and tarrifs before they even make it into the country. Apple probably hides most of its profits off shore anyways to avoid taxes. Wow thats a bit over the top. That would really give Samsung dominance in the smartphone market of usa. It wouldn't.. there's still HTC MOTO LG . Giant technologies in the battle field, Samsung tried to ban Apple products from the USA is not going to happen because every products sell in the USA are imports. USA is the world largest imports country. What happen if Apple trying to ban Samsung products from the USA? 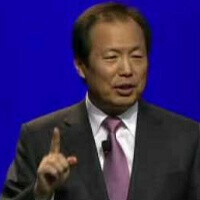 Apple and Samsung must drop all the lawsuits, shake hands, doing business as normal and every body will happy. Go Samsung, f**k that dirty fruit upside down! All manufacturers will undoubtedly provide legal funds in support for Sammy as they would all hugely benefit. Bill Gates is probably laughing his pants off.